Make your Lawn Jockey statue "glow in the dark"! A special accessory and finishing touch for your Lawn Jock is a real working or decorative lantern. A lantern add aesthetics to your lawn jockey during the day and at night. And at LawnJock.com, our goal is authenticity in our lawn jockey lantern designs! 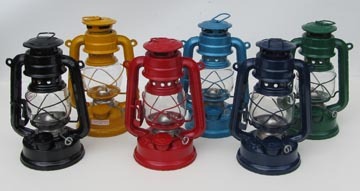 Our lantern replicas are true to the historic style, size, color and function of the originals from over a century ago. A nostalgic journey back in time to when your great-great-great grandparents ice skated on frozen ponds by the light of the moon. Before Thomas Edison invented the light bulb in 1879, jockey statues originally had oil lanterns. There were no specific "lawn jockey lanterns" for sale but there were small "skater's lanterns" available that were about 1/2 scale of a standard size lantern(a full size lantern was too heavy and would cause a loss of balance!). Since the jockey statue is about 1/2 scale of a human, these skater's lanterns worked well on the jockeys. A jockey lantern recalls the romantic gilded age winter pastime of ice skating by the light of the moon. TOP PHOTO: Next to our black solar lantern, a 1918 Dietz "Scout" oil lantern(that was converted to electricity) from an 1800's lawn jockey. 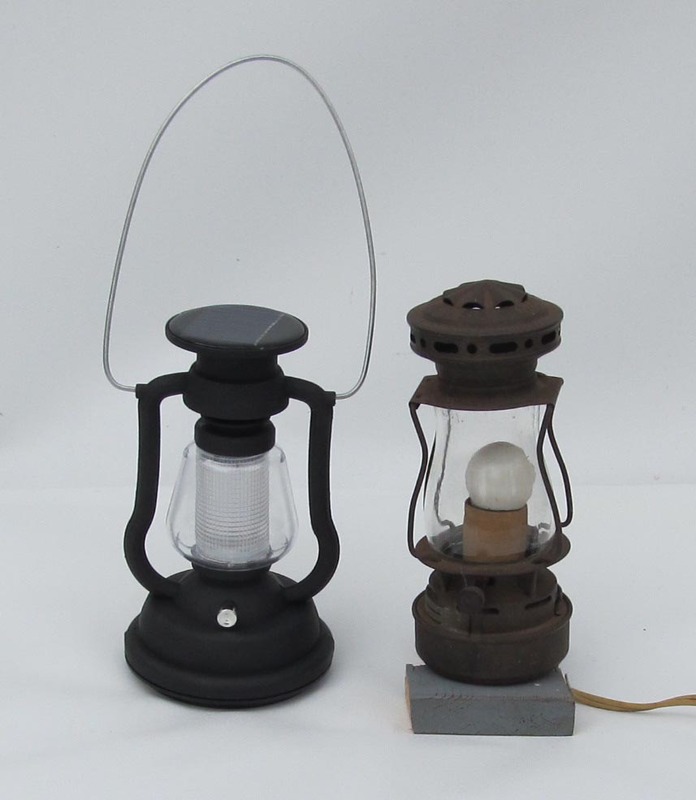 The same model was identical to skater's oil lanterns made by Dietz dating back to the 1840's. 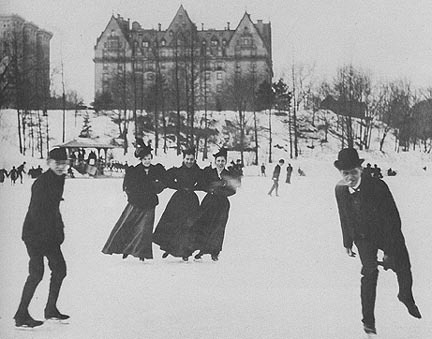 BOTTOM PHOTO: Ice skaters in New York's Central Park in 1876. By 1920, most of the horse-drawn carriages that used to tie up to the jockey hitching posts had been replaced by cars. But before the carriages were scrapped, many of their square-style lanterns were salvaged and ended up in the jockeys hand. 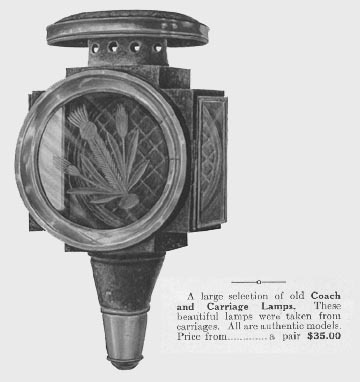 These ornate brass and tin lanterns with exquisite glass etchings were also resold through mail-order catalogs alongside the jockeys. ABOVE: Ad from 1952 Kauffman Riding Goods catalog. We offer 2 types of lanterns: solar and oil. We have found these to be the easiest, safest and least evasive additions to the statue. Since this procedure obviously deals with electricity, a professional electrician is recommended for electric lamp installation. Since the statue is made of aluminum which conducts electricity and will last much longer than the plastic that coats the wires, LOW VOLTAGE wiring ONLY is strongly recommended to avoid a "shock jock" years down the road. We are currently working on the development of a low-voltage electric lantern that will be available soon. Lanterns can be ordered separately from the jockeys and can also be used as stand-alone patio decorations. 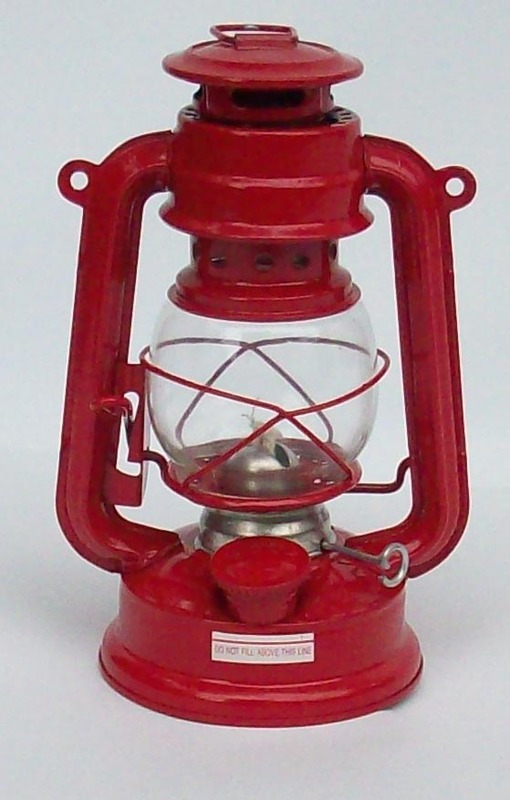 Lanterns come fully assembled and come complete with a galvanized steel wire handle. 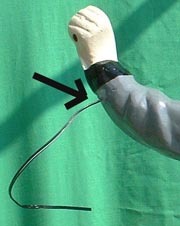 Lanterns are easy to attach to any jockey with a hole in it's hand- just loop the lantern handle wire through the hole in the Lawn Jock's hand and bend it back to attach to the lantern. Most people use rugged oil lanterns for display/decoration only, but they can be filled with fuel and lit up too(but must be watched carefully due to the fire hazard). Instructions are included. Construction is glass and tin metal with enamel paint coating. 6 colors are available to coordinate with your jockey color or patio decor. Lawn jockey solar lanterns are made of durable plastic and all electronics are internally sealed with silicone for maintenance-free outdoor use. 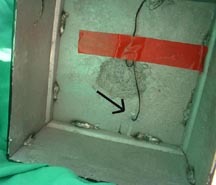 The outer lantern housing cannot be sealed due to condensation but has a drainage hole in bottom for water to escape - batteries are located in a separate weather-resistant compartment underneath the lantern. Solar lanterns are mainly decorative in that they are bright enough to be seen, but not functional for lighting large areas. Solar lanterns feature "lifetime" LED bulbs that never need changing, easy one button operation and automatically turn on at night and off to charge in the day... just set it and forget it!